In 2008, a team of archaeologists discovered a fossilized fragment of a pinkie finger in the secluded Denisova Cave in the Altai Mountains of Siberia. The finger was buried with bracelets and other artifacts typical of early human sites dating back about 35,000 years. It was sent to the Max Planck Institute for Evolutionary Anthropology in Leipzig, Germany, for routine genetic analysis. When the results came back, Johannes Krause, a researcher at the institute, called his colleague Svante Pääbo on his cell phone. "You'd better sit down," he said. "The finger is not human." Genetic analysis of the finger bone has since indicated that it was a remnant of a previously unknown hominin, distinct from both early modern humans and Neanderthals  the heavily muscled Homo species that cohabited with Homo sapiens in the region from 50,000 to 30,000 years ago. Early modern humans, the results suggested, shared parts of Eurasia not only with Neanderthals but a totally different human-like creature, and all three probably came into contact (the finger bone was found within 65 miles of known Neanderthal and modern human sites). Krause and Pääbo's analysis, published online on Wednesday by the journal Nature, is the first to identify a novel hominin based on genetic analysis alone  without fossilized remains to offer anatomical reference. But the researchers stop short of declaring the human-like creature a brand-new species. Instead of giving it a Latin name, they refer to the creature publicly as "the Denisova hominin" and in internal e-mails and discussions simply as "X." But privately, scientists at Max Planck  a world leader in the painstaking process of separating genomes from other DNA (of viruses and bacteria, for instance) that typically contaminate fossils  believe that the sequencing of the Denisova hominin's nuclear genome, which will offer a complete genetic picture, will confirm a new species. Krause says the sequencing has begun, and will be complete within a few months. Wednesday's results come from an analysis of the creature's so-called mitochondrial DNA, which is inherited only from the mother, and therefore does not give as complete a picture as nuclear genome sequencing. "In terms of mitochondrial DNA alone, this hominin was twice as distant from us as Neanderthals," says Krause. "The evidence is already very strong that we are looking at a previously unknown hominin, and possibly a new species." Scientists have no idea what the Denisova hominin looked like or how it behaved and interacted with early modern humans, and perhaps never will without a more complete fossil record. But even the preliminary genetic analysis has already shed new light on human ancestors' exodus from Africa and subsequent spread across the globe. The dominant theory holds that various hominin species left Africa in a series of distinct migrations, beginning with Homo erectus or a close relative a little under 2 million years ago, followed by the lineage that gave rise to Neanderthals, and finally the ancestors of modern humans about 50,000 years ago. The mitochondrial DNA of the Denisova hominin suggests its ancestors left Africa around 1 million years ago, at a time not previously associated with migration. "I speculate that we may discover that it is an oversimplification to talk about particular exodus events from Africa," says Pääbo. "There might have instead been a continuous gene flow and migration." Pääbo says that because the Denisova hominin is assumed to be human, it's possible that there are many other unknown hominin fossils waiting to be discovered. He says paleontologists will continue to scour for remnants in Siberia and other northern regions, where cold weather helps preserve ancient DNA. Most early hominin fossils are from equatorial and tropical regions, where conditions for DNA survival are poor (indeed, although fossil records suggest a distinct hominin species, Homo floresiensis, co-existed with humans in Indonesia, genetic confirmation has proved elusive). Ian Tattersall of the Department of Physical Anthropology at the American Museum of Natural History, who was not involved in the research, calls the Denisova hominin a "significant addition" to the emerging picture of our past  one we now know we shared with a number of other hominin species. "We are the only hominin around today, so we tend to think that's how it's always been. But the evidence is accumulating that the human evolutionary tree is quite luxuriantly branching. There were multiple species that competed in the evolutionary arena, rather than a single lineage that was honed from primitiveness to perfection." Indeed, the discovery and genetic mapping of the Denisova hominin may also shed further light on the mystery as to why our species thrived while so many of our close genetic relatives succumbed to extinction. "We wish to find out which genes have changed since we split from these other human forms. Those changes are what makes us human  it's the biological reason for the great success of our species," says Krause. The fossils of early modern humans have been discovered alongside artifacts  such as bracelets and necklaces  that indicate they had culture. 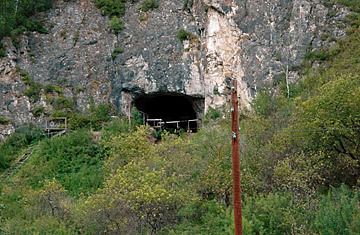 And Krause says the location of the Denisova hominin  among artifacts assumed to be human  raises the possibility that the Denisova hominin was similarly advanced. "The fossil was found with modern technology and ornaments, including a very beautiful bracelet," he says. "It's a big step to argue that the Denisova hominin created them  if you find a Coca-Cola bottle near a mummy's tomb, you don't assume that the mummy invented Coke. But the coincidence is tantalizing." Krause says he does not spend much time engaged in such speculation. At the moment, he and his colleagues are preoccupied with sequencing the Denisova hominin's nuclear genome. Using high-tech lab equipment and supercomputers, they are trying to make sense of this strange and startling discovery, in much the same way that their ancestors might have done tens of thousands of years ago, when they peered out into a windswept Siberian clearing and saw creatures at once familiar and foreign moving through the snow.